The Senate President, Dr Bukola Saraki, on Wednesday, said the Peoples Democratic Party would defeat President Muhammadu Buhari of the All Progressives Congress in the 2019 elections. 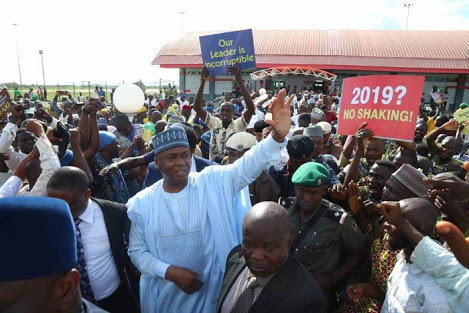 Saraki, who spoke in Ilorin, the Kwara State capital, during a harmonisation summit for the PDP members and those who recently defected to the party from the APC, added that he was hopeful that the PDP would emerge victorious. Saraki said, “In 2019, the PDP will produce the President. If we emerge victorious at the federal level, all of us will be the beneficiaries. In the state, with your support, we will win the state too. All of you here are the key players in Kwara politics. With the unity of purpose, no party can contest with you. We are here to unite all of us under the party we belong to today. “I am assuring all members that there will be equity, internal democracy and justice. It is not going to be a winner takes all. As far as I am concerned, everybody here today belongs to our political structure. There is nothing like old or new PDP. We have all become one PDP. “There is nobody here that will not say, one way or the other, we have not been together before. I am very sure that the future is bigger and brighter than in the past. I want all of us and the development of Kwara State. The Senate President said he did not have anointed candidates, adding that there would be transparency and inclusiveness in the choice of candidates for different political offices. He also said he had not endorsed any candidate and appealed to party leaders not to use his name to impose unpopular politicians as candidates on the party. He stated that he did not have a candidate for the National Assembly, adding that he and the party members would jointly choose the next governor of the state. Saraki said, “We will see that all the wards and local governments’ popular candidates emerge based on their popularity and acceptability. I want to emphasise that I don’t have any anointed candidate at any level. I don’t have candidates for the state assembly; it is the person you want in your constituency that I will approve. Don’t allow anybody to deceive you that I have endorsed any candidate. “I implore party leaders and elders not to drop my name to impose unpopular candidates. I don’t have a candidate for the National Assembly. All of us will collectively choose the next governor. We will ensure that there is no faction but one PDP. We will ensure that meetings in the local government areas take place in one venue. And we will all work together for the interest of the party. He stated that he was hopeful that many of those who defected from the PDP to the APC when he returned to PDP would return to the party. The Senate President said those who defected from the PDP to the APC when he returned left under a wrong assumption. He promised that everybody would have a sense of belonging. Saraki urged both old and new members of the party to ensure peace and harmony in their wards and local government areas. The former governor said, “Please, go back home to start the work. I am sure many more will come back and join us because those that left did so under the wrong assumption that it would be different from what it used to be. They were misled that those coming were out to move them away.